When I complete a grooming, something magical happens. The Giant stands a little taller with a highly esteemed stance of “I look good!” knowing full well, THEY DO, and they feel better too! Visiting your professional groomer can add up quickly, especially on a monthly basis, and grooming from home can be a more affordable option and way to spread out visits to your groomer. It also provides the perfect opportunity to really bond and inspect your Giant Schnauzer from head to toe and nip any problems in the bud quickly or better yet prevent them, which can also save time and money spent at the vet. For Giant Schnauzers, regular grooming every 4-6 weeks is a necessary part of having this breed of dog. If you are pet owner and would like to maintain your Giant Schnauzer on your own, with a little practice and a decent dog grooming clipper you will be well on your way! We have two sections of information to consider. 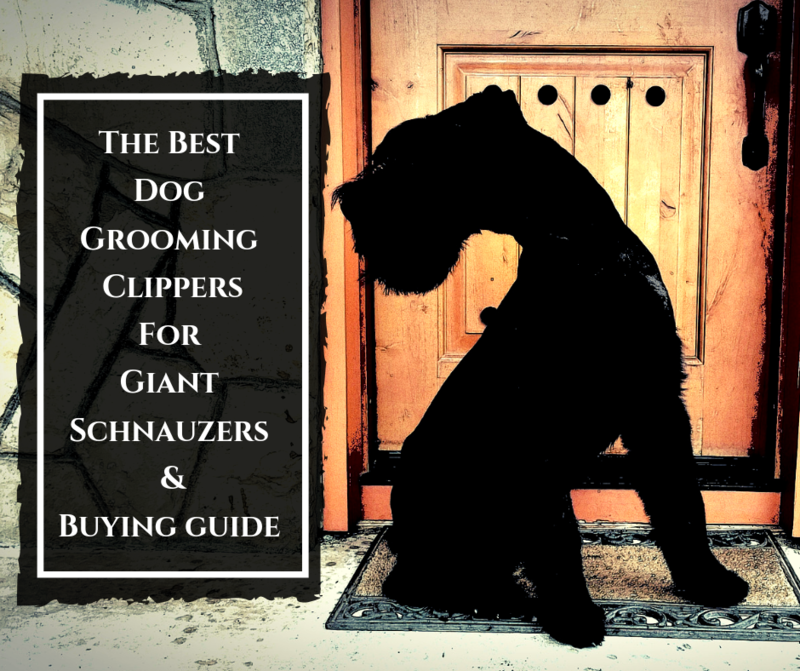 The first being The Buying Guide which describes key features for dog grooming clippers and the second is The Best Dog Grooming Clippers for Giant Schnauzers. but, if you are new to grooming, you may learn something by reading further on. Each dog grooming clipper will have varied features and you will notice terms used like SPM or strokes per minute, single-speed, variable-speed, low-noise, low vibration, detachable blade, corded, cordless, lightweight, heavy-duty and super-duty. These will all have vast importance when considering The Best Grooming Clipper for Giant Schnauzers and all come down to your own personal preference and needs. The most important question to ask yourself is, “Can this clipper tackle my Giant Schnauzer’s coat? When choosing the right clipper, the cost is not always the most important feature to consider, there are several in the mid-priced range that can get the task done you set out to do. Flip on a set of grooming clippers and watch the blade move side to side. This movement is referred to as strokes per minute or SPM. The faster the movement the more speed and strokes you have. LOW SPM– tend to have less heat build-up on the motor as well as the blade. HIGH SPM– can power through the job but, will heat up your blades quicker. It’s good to have additional blades on hand to switch out if your clipper is equipped with a detachable blade system. Single-speed dog clippers have a blade that rotates at one speed and tend to not heat up as quickly. These are generally inexpensive compared to clippers with multiple speeds. An experienced groomer may have several clippers depending on what they are trying to accomplish, but for beginners with puppies, these can provide a great learning curve since they typically don’t run as hard and at high speeds nor heat up as fast. If you have an adult dog these could pair well with a second set using this type of clipper for around the face, sanitary, ear and feet areas. Variable-speed clippers will have more than one speed, running at low and high settings. Multi-speed clippers generally have two or five speeds. This allows more control for the pace you are comfortable working with as well as give you more versatility that one grooming clipper can provide. Low-noise and vibration are important features to consider when you have an anxious dog or puppy not use to the grooming process. For dogs accustomed to being handled and groomed regularly this may not be something you need to think about. Each dog grooming clipper will vary in size and weight. Some clippers may provide a powerful motor but, will also need the space to house such a mechanism, leaving them slightly bulky. Other clippers may be lightweight and ergonomically designed to fit smaller hands and can also have a powerful motor to cut through even the thickest of coats. If you spend a lot of time grooming this may be something to consider for your own comfort. Corded clippers have ongoing power. This is great if you plan to groom for longer than one-hour periods which is typical run time for cordless clippers though not always. Longer cords can reach further around your pet and grooming table (if you have one), keep this in mind when you think about how much area you will be moving around. Cordless clippers are nice for their ability to travel with you wherever you go. You might be planning to trek across the U.S., or you may be headed to a Show. In either case, a cordless clipper may be handy to have. Most cordless clippers need recharging after about an hour. If grooming takes you longer than this, you can purchase an extra back up battery, if your clipper has the removable battery pack. Some clippers also have the ability of being corded or cordless. In that case you can also purchase a cord pack adapter for plugging into an electrical outlet. Another great feature to the cordless clipper is you’re able to move around your dog without the hassle of a cord getting in the way. Some clippers allow for interchangeability with other brands while others are designed specifically to match the dog grooming clipper. Either way, the sharpness of the clipper blade for its cutting ability will be the important feature here. Detachable blades can be switched out quickly and easily as they heat up. Other blades may not be detachable but, provide multiple blade settings in just one blade. You will need to check often for any heat of the blade as you work so that you do not burn your Giant Schnauzer. Cool Care Plus cooling spray is good to have on hand and be sure to wipe off any excess before continued grooming. Clippers blades in general are constructed from two types of material, ceramic or steel and there are advantages to both. Ceramic blades stay sharp longer with the ability to cut through even matted coats and stay cooler as you work. They are a little bit more expensive and tend to not sharpen as well as steel blades. By maintaining them on a regular basis and not dropping them they can last for years to come. Steel blades are generally less expensive than ceramic. Steel blades are also easier to sharpen and sanitize. Keeping blades clean of hair and dirt, sanitized and oiled after each use will help to keep blades cutting hair properly and performing at their best for many grooming sessions to come. The Andis AGC2 is a professional grade grooming clipper with a powerful rotary motor and versatility of two speeds, 3400 on low and 4400 strokes per minute on high. This clipper has been created without fans or air vents which often become clogged with hair and dirt, making the maintenance for this clipper a breeze. The UltraEdge provides enough power to cut through double coated breeds like the Giant Schnauzer, yet quiet enough to use on a puppy. The 14’ heavy duty cord provides continuous power and gives you plenty of room to work around your pet. It features a detachable blade system makes switching blades and cleaning a cinch. Check the heat of your blade often and manage comfortable temperatures by changing blades with this quick and simple function. The UltraEdge is compatible with all Andis detachable blades including CeramicEdge which we recommend since they stay cooler. This clipper is marketed to work for all coat types and dog breeds. It is a well-rounded clipper, available in 5 colors. Like any heavy-duty clipper, this does heat-up fairly quickly in our opinion. In the same token, we really like this clipper for its smooth cutting ability and for working around puppies – it works quietly and does not vibrate roughly. The Oster A5 is a durable heavy-duty clipper built with a turbo powered rotary motor with high speed and can work through even the most matted coat. This clipper has a wider blade sweep yielding in faster results. It performs at two variable speeds of 3000 strokes per minute on low, 4000 on high and powered by a 12’ heavy-duty cord. It is durable, and the chances of this grooming clipper withstanding being dropped are good. This clipper works for all breeds and coat types including thick and course coats and not just for Giant Schnauzers, this is meant to work with horses and livestock too. These have a #10 Cryogenic detachable blade made with more durability in the hardening process. Also, the detachable system simplifies changing the blade out during a full body grooming and are compatible with all Oster A5 detachable blades and Andis detachable blades including the CeramicEdge. This kit includes replacement brushes and will require some maintenance to keep it in prime use. Included with this package: Oster Grooming clipper, #10 Cryogenic-X blade, blade oil, clipper grease, cleaning brush and replacement carbon brushes. This grooming clipper is striking at first glance in its unique colors. More importantly, the Wahl KM10 has great balance for maneuvering through longer grooming sessions with your giant schnauzer. Designed to fit comfortably in your hand, this clipper has been built ergonomically and lightweight at 12.3 ounces for better control and less hand fatigue. Powered by a brushless motor, it provides lower heat levels, low vibration and low-noise without the maintenance for changing brushes and gives an extended life of 10,000 hours. It delivers two speeds of 3000 SPM, and 3700 SPM on high setting. This grooming clipper glides smoothly through hair and is marketed towards all coat types and even thick or matted coats for complete body shave down or trim work, and includes dogs, cats, horses and livestock. Like the other clippers we have talked about, this too has a detachable blade system and powered by a longer cord of 14 feet. Professional groomers acknowledge these clippers for their low-noise and low vibration specifically while clippering dogs or puppies that tend to be a little spooked. The Wahl Ultimate Competition #10 Series Blade ensures lasting durability with the high-grade steel. For best performance it is recommended to use the Wahl Ultimate and Competition series blades but, these will also work with Andis and Oster A5 detachable blades. This clipper package includes: Wahl Grooming clipper, Wahl clipper oil and a blade brush. It is available in Berry or Turquoise and carries a 5-year warranty. We think the price tag for this clipper is a little steep when you compare the overall value to other dog grooming clippers. This is marketed as a super-duty performing clipper. The Pulse ZR II is a cordless clipper that now features a detachable lithium-ion battery, so you never run out of power. Something worth noting- on a single charge this cordless clipper provides up to 3 hours of run-time. This gives plenty of life to do a full body grooming for a Giant Schnauzer. Additional battery packs are sold separately. Speed-wise, this clipper operates at 5-speeds from 2500 to 4500 strokes per minute on max setting. It has a powerful rotary motor and is marketed for all hair types. The blades are compatible with Andis UltraEdge, CeramicEdge, ShowEdge and Oster A5 detachable blades. This clipper includes a #10 CeramicEdge blade which we like. It is lightweight at 1.1 lbs. and carries a 1-year limited manufacturer’s warranty. The Pulse ZR II is available in black. The first of the series was noted for having charger port issues, which makes us wonder if this will be an issue with this second series clipper. The anticipation of bringing a new puppy home is exciting. It is just like having a new baby! On one hand there is nothing more delightful than a new little ball of energy to love on and shower in kisses. On the other hand, there are some things that will take some getting used to such as cleaning up, vet health checks and making sure you puppy-proof your home and yard. Unlike some breeds, Giant Schnauzers have additional care to maintain such as grooming- to keep them looking their best, and training- so they can be on their best behavior. 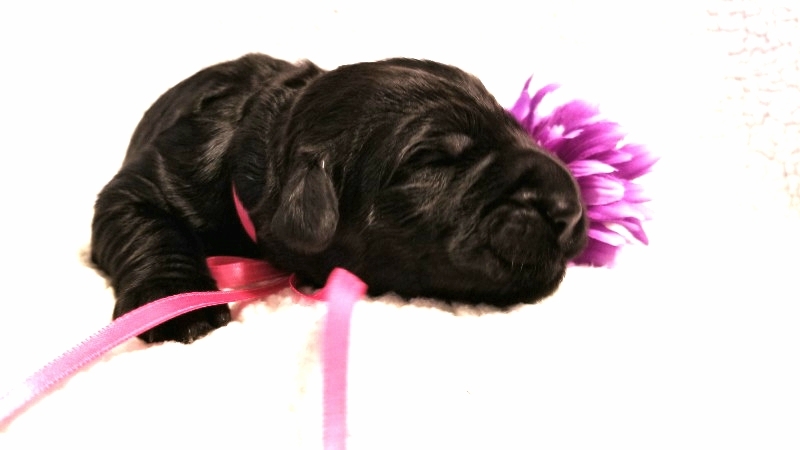 Keep in mind that a Giant Schnauzer puppy will grow a lot over the next year and it is better to get a handle on these areas sooner, rather than later. Having a Giant Schnauzer is very much a hands-on learning experience- you won’t know what it’s like living with one, UNTIL YOU DO. 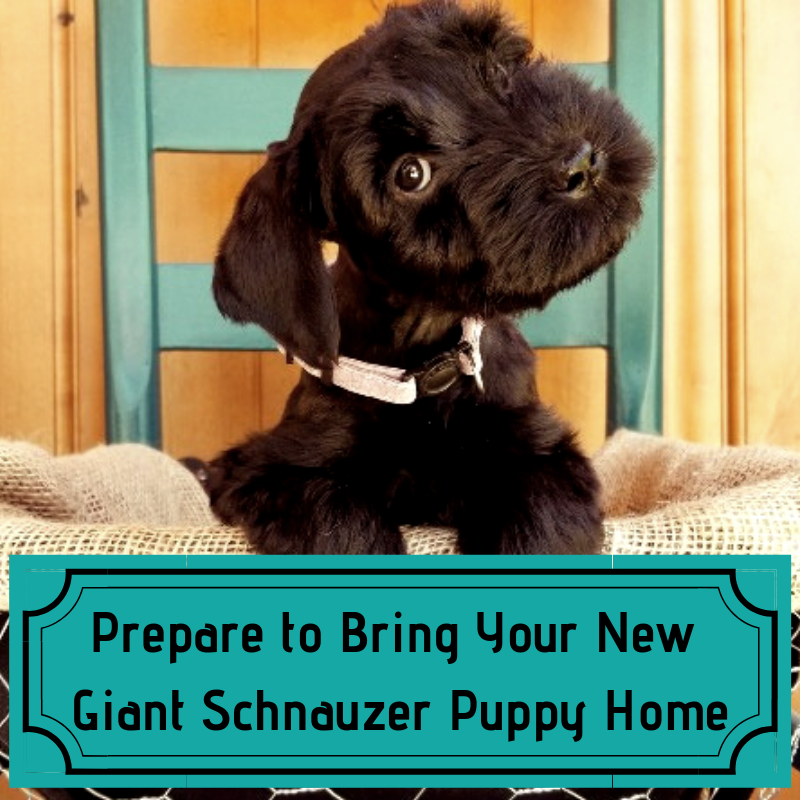 We wanted to make sure you can be as ready as possible and Prepare to Bring Your New Giant Schnauzer Puppy Home. Food *check with your breeder for the food your puppy is currently eating. *Always be careful with toys. Be sure they are not too heavy to lift or small enough to get lodged and cause choking. These are an excellent training tool for crate training and house training. 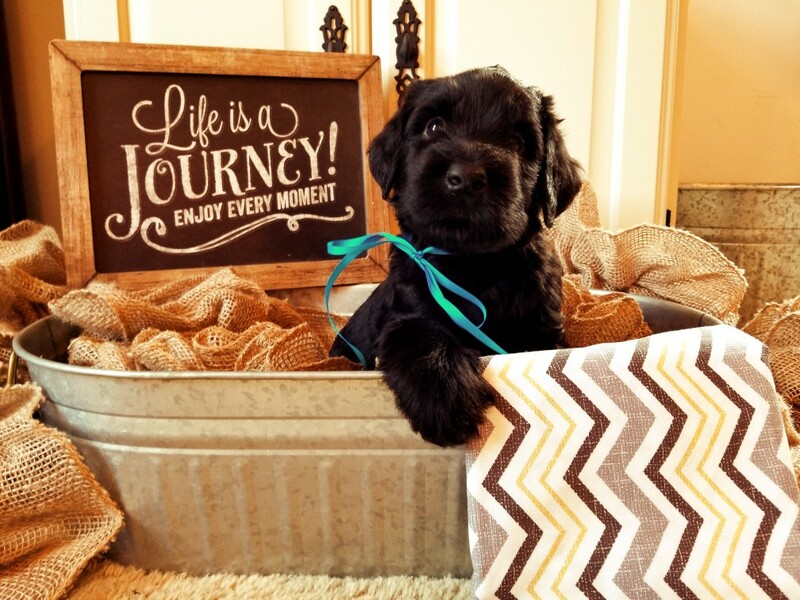 A Giant Schnauzer puppy on a regular schedule will help you to create good habits. A crate will also make a nice spot for your puppy to call their own. Make it fun so they can associate their crate with all good things rather than an area of punishment. You want them to love it. Crates can also help in times of travel to keep your pet safe and secure. No puppy or dog should ever be crated for long periods of time. Your puppy should be let out every couple of hours even if that means hiring a dog sitter, dog walker or enrolling in doggie-day-care. 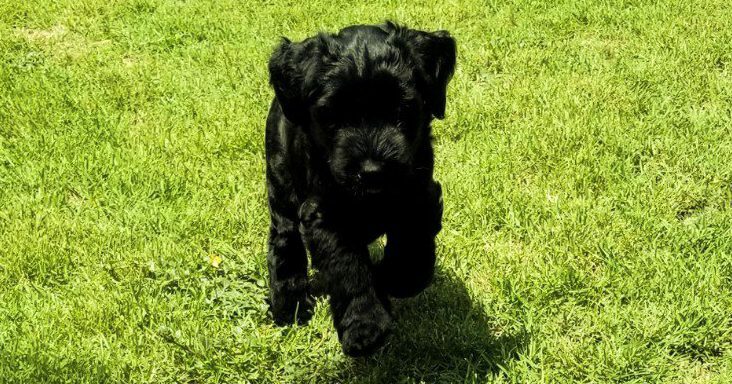 Your Giant Schnauzer puppy will need plenty of exercise, mental stimulation and socialization which can hardly be done from crate. Midwest Lifestages 30-inch wire dog crate: Good starter size for puppies. Midwest Lifestages 42-inch wire dog crate with a divider panel: A good size until puppy is around 5 months old. Midwest Lifestages 48-inch and 54-inch wire crate(s): Appropriate adult size and generally depends on whether your Giant Schnauzer is a male or female. If you are interested in purchasing one crate, the larger crates here include the adjustable divider to size right during house training. For puppies, bedding that is washable and will hold up through chewing phases are ideal. It is a good idea to have an extra one on hand in case there is a need to wash while your puppy is house training. By keeping it basic for younger puppies, has worked out best for us here but, for young adults up to senior Giant Schnauzers the best beds of been K9 Ballistics, Big Barker and Kuranda Dog Beds. For large breeds, it is important to get them up and off of hard floor surfaces to help support their large bone structure. At 8-weeks the right sized collars measure approximately 10-16 inches. When walking your dog be sure you have a durable collar and not the breakaway style. Whether you use a collar and leash or a front clip harness, it’s crucial to train your puppy to walk on a “loose leash”. There is a lot happening in the throat area that you don’t want to cause any damage to. Back clip harnesses encourage pulling like sled dogs, therefore we don’t recommend this type of harness. We also discourage the use of retractable leashes for safety reasons. 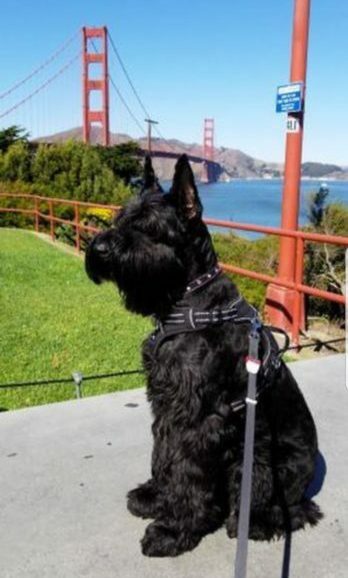 If you are having trouble walking without pulling, the Halti Head Collars have been successfully used by many Giant Schnauzer owners. If you find you are still having trouble, get with a professional trainer in your area. Your giant schnauzer is going to need a lot of consistent training. For those who are food motivated, treat training is a quick way to get your puppy’s attention and makes the reward fun for them. We prefer protein treats for our own puppies and adult dogs but, there are times it is hard to steer away from carb type treats. At the very least, it is better to keep your Giant Schnauzer on the lean side (not skinny but, LEAN). They have a lot of growing to do and will not be developed enough to support added weight until the growth plates have closed (2-years-old). Food and Water Bowls- Stainless steel no-tip and non-skid food and water bowls are preferred. Otherwise, your puppy will be pushing their food bowl around the kitchen without any good traction to support them. Plastic bowls are not recommended for several reasons, mainly because they trap bacteria that spreads to your Giant Schnauzer’s beard causing acne or other unsightly and uncomfortable bumps around their lip and chin areas. Many plastics also contain toxic material that a lot of dogs are sensitive to. Dripless water bowls– Everyone loves their Giant Schnauzer partially due to their impressive good looks and they are known for having that amazing beard. A Giant’s favorite thing to do is take an enormous drink of water and venture over as much of your furniture as possible before setting that very wet beard on your lap. Did I mention I’m pretty sure that beard holds a gallon of water!?! Kidding BUT, many owners have found the Slobber Stopper to be of great benefit by reducing the amount of water scattered around your home and you. Size medium or large are generally recommended for an adult. Slow feeders- like the Our Pets Durapet Slow Feeder can help encourage your puppy to slow down if they are eating too quickly. If you have a puppy/dog that eats too fast it is very important to get them to slow down. Bloat is a serious condition that mostly, but not always, can affect deep chested large breed dogs. Dental care– Just like people, dogs need regular brushing and dental care to keep them healthy. Brushing daily is ideal but, even a few times a week is better than no brushing at all. We use an enzymatic cleaner formulated for dogs and a dog toothbrush. Done regularly, they don’t seem to mind too much. We like the C.E.T Vanilla Mint for our Giant Schnauzers. Grooming your puppy is one of the best things you can do to bond and build a trusting relationship with your Giant and it can be rewarding for the both of you. Maintaining your Giant Schnauzer’s coat, ears and nails are part of caring for their physical health. When adding toys and treats to your list, do not forget some essential grooming supplies. Here are a few basics to help you get started. A shampoo formulated for puppies is recommended. These should be gentle and tearless without added harsh chemicals. Following up with a good conditioner is ideal to work through their hair without pulling. Giant Schnauzer have hair, not fur and there really is a fair amount of maintaining to be done. Choosing a suitable brush and comb can make all the difference depending on your dog’s hair needs at that time. Your Giant Schnauzer may benefit from each of these style brushes and combs. Slicker brushes are used on medium to long haired breeds to break up matting, tangles and gives a nice finished look to separate hairs. An added benefit to this brush is that it quickly removes weed debris such as burrs. Pin and bristle combo brushes are used for medium to long haired dogs. The wire pin side is great for before bathing brush out, as well as maintenance brushing. The bristle side works well if you have a Giant Schnauzer that needs a little dusting after a good roll around outside in the dirt. Metal combs are a handy tool to have. These can be used to reach in areas a brush can’t quite reach and are generally used around the face area including brows and beard. These are great for finish work and will help you to find the right lines and hair that is out of place. Rakes and Dematters work best on severe matting and tangles. Nail trimming can be stressful for a dog making it difficult for owners too. When using nail clippers, you will want to be certain they are sharp and will cut through nails quickly to lessen the chances of spooking your pet. Our Giant Schnauzers prefer a rotary tool over clippers though we tend to use both. Nail clippers– For a puppy, you can start out with regular baby clippers but, soon you will need a regular set of dog nail clippers. I prefer using the Miller’s Forge because of their sharp cutting ability. Styptic powder such as Quick Stop can be used if you clip the quick of your dog’s nail to stop the bleeding. Nail grinders are for smoothing nail edges and grinding down nails gradually. For puppies, you can perform this task with a simple emery board and start in with a nail grinder another day. Be sure to use proper techniques, the faster the rotary tool, the more heat that can transfer to your pet’s nail. Giant Schnauzers have hair, not fur and it grows in their ears too! Regular attention is needed in this area to avoid problems such as ear infections. This includes plucking of the inner ear hair as well as regular cleaning. Notice the photo with the hair in my hand? This is just two-weeks of ear hair growth from one of our own Giant Schnauzers. Ear cleaners are used as a flush to clean out the ear canal. Ear powder stiffens the hair for plucking the ears and makes removing it easier. Professional groomers and owners often use clippers to quickly and efficiently get their Giant Schnauzer’s hair back in shape and looking like their sharp self every 4-6 weeks. Proper care of the coat involves hand stripping which takes more time, and many pet owners opt to use dog grooming clippers instead. We think the Andis UltraEdge Super-2 performs well with its 2 speeds that provide enough power on low and quiet enough to work around a puppy. Being a heavy-duty clipper, it does tend to heat-up and blades should be changed out often to avoid burning puppy’s delicate skin. This clipper has a detachable blade system that also works with Andis CeramicEdge blades which we prefer since they stay cooler than traditional blades. Don’t forget blade combs. Professionals will use scissors to neatly trim and give brows their expressive look and work around leg hair, belly, chest and feet areas and thinning shears to blend. At least a variety of 4 toys are recommended. 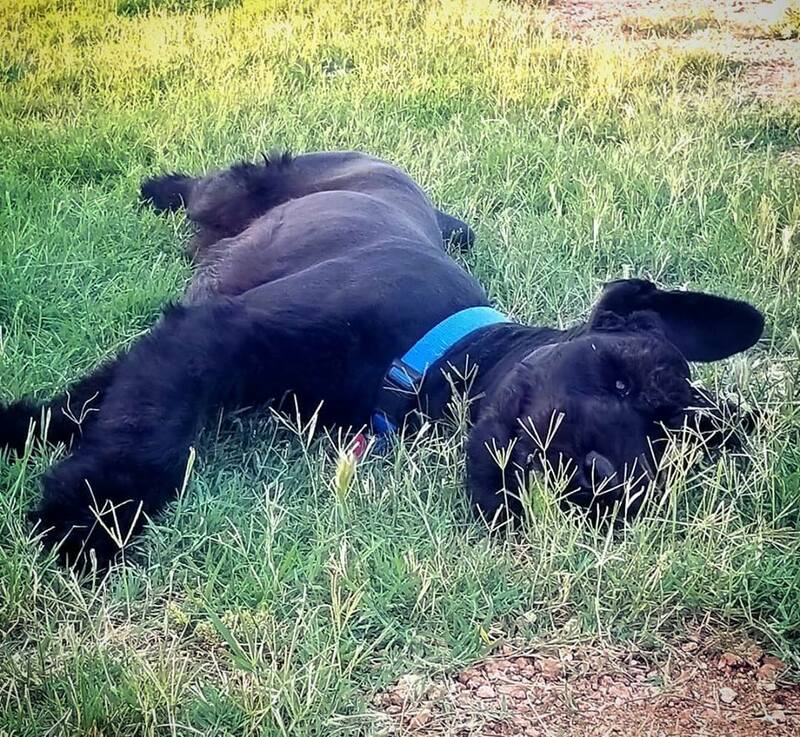 Giant Schnauzers are a thinking breed… Give them something to do! Mental stimulation is so important and by adding interactive toys to the rotation will stimulate fun for your puppy and may keep them out mischief and eventually causing harm to furniture and your home. Keep it entertaining and rotate in new toys weekly. You will be AMAZED with how quickly they can learn new things. A good dog probiotic will aid in gut health, good digestion as well as boost the immune system. Our adult dogs and puppies are given daily probiotics and we see the benefits of a good healthy gut. Human studies have been documented to show their effectiveness on diarrhea, irritable bowel and inflammation in the intestines. Many pet owners and veterinarians have turned to dog probiotics because of their observed benefits not only for short-term effects, but long-term as well. Depending on how you plan to potty train can vary in the supplies you will need. Having a schedule and sticking to it will help to achieve the most successful results. If you plan to use potty pads, I would steer away from this method as quickly as possible or chance the idea in your puppy that it is okay to potty inside your home rather than outside. Ollie & Khali celebrated their 4th Birthday this week! Khali’s mom treated her to frosty pup treats and insists Khali is her “child”. Can anyone say “LOVE”!?! Smitten Breeder here, smiling EAR-to-EAR! She spoils her rotten and has taken her all over the U.S. – by plane! She just grabs an extra seat to take her girl wherever she goes. Thank you for keeping her needs and desires utmost in mind. I know she is exactly where I would want her to be. Ollie here (Khali’s littermate) with her Sister Sophie, also had her 4th Birthday! Though, I wasn’t met with happy thoughts this week as Ollie has decided to take up chewing the door frame- Not once but, Twice!! Thankfully, not all weeks are the same and I have had the pleasure of having a regular relationship with her family so, we discussed some good positive direction to help nip this problem in the bud. Her Dad and I laughed this morning. He asked how the dogs were doing. I said, “Good. Nobody’s chewing up door frames here, although they have taken up digging holes at the fence line- trying to get to the rabbits”. We both laughed so, today can’t be too bad! Grace and Mercy on their morning walk with the family. When we had all that rain, the flooding (that didn’t quite get this far) and the tornado.. this Supermom checked on us regularly and they have been a great addition to our extended Giant Family! As always- Super cute kids! The Giant Schnauzer has a great mind that should not go wasted. Stimulating the mind is just as important as exercise and it is different. Teach a new trick. Do nose work games. It’s amazing what they can do if you take the time to work with them. Giants are not fully developed until their growth plates have closed (24 months). A puppy should not be exercised the same way or amount of time as a full grown adult Giant. They are very energetic and need a good amount of daily exercise. As puppies, they need to be able to romp, have play sessions and explore the ins and around your yard. Daily walks are also good. You should avoid high-impact exercise until they are fully grown. Let the Outdoor Fun Begin! First outings have begun, and these Babies are having a blast! I absolutely LOVE to watch them experience things for their very first time. They had no idea what to think yesterday and today they cannot get enough! It’s hot and we are out for very short periods of time. They have not mastered “let’s go inside” or “outside” but, that’s to be expected… they are just tiny little puppies. Before you know they will be like super fast little toddlers putting everything in their mouth along the way. Families BEWARE! I would recommend puppy proofing your homes and yard. A couple of years ago I started to incorporate a more natural approach to pests for both our yard and pets (at an appropriate age) and have had great success. This is Texas and yes everything is BIGGER here including the bugs. I realize we need to be proactive, yet I feel better putting little feet on grass that has been protected by safer products rather than harsh chemicals. Just when I think I can’t be any MORE IN LOVE… This happens! Kaia & Sebastian’s litter @ 5 weeks. Sorry, We have no available puppies at this time. Please check back to our PUPPIES page for details. Enjoy this video and don’t forget to visit our new Shop page for Giant Specific products & supplies! 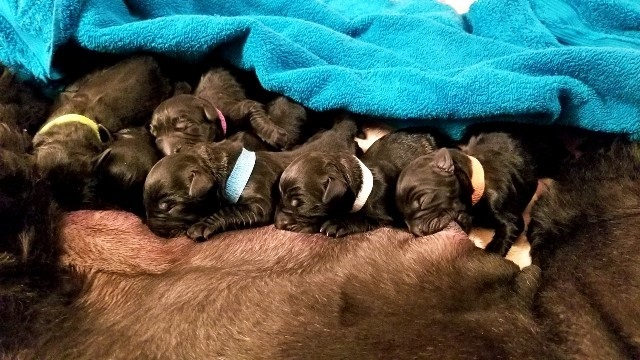 9 Little Bundles of JOY! Kaia & Sebastian’s babies are here and…. I’m absolutely SMITTEN over them. She had 9 babies with 4 Boys and 5 Girls Born: July 14th. I Thank NuVet for an amazingly smooth and quick delivery (which started at 3 am… of course). It couldn’t have went any better! Kaia is doing great and mommying fabulously! The puppies do what they do which is sleep a lot and make thier way to the milk bar. It’s been busy busy around here and I thank you all for your patience through the New Website and thoughtful consideration for timely scheduling this week. 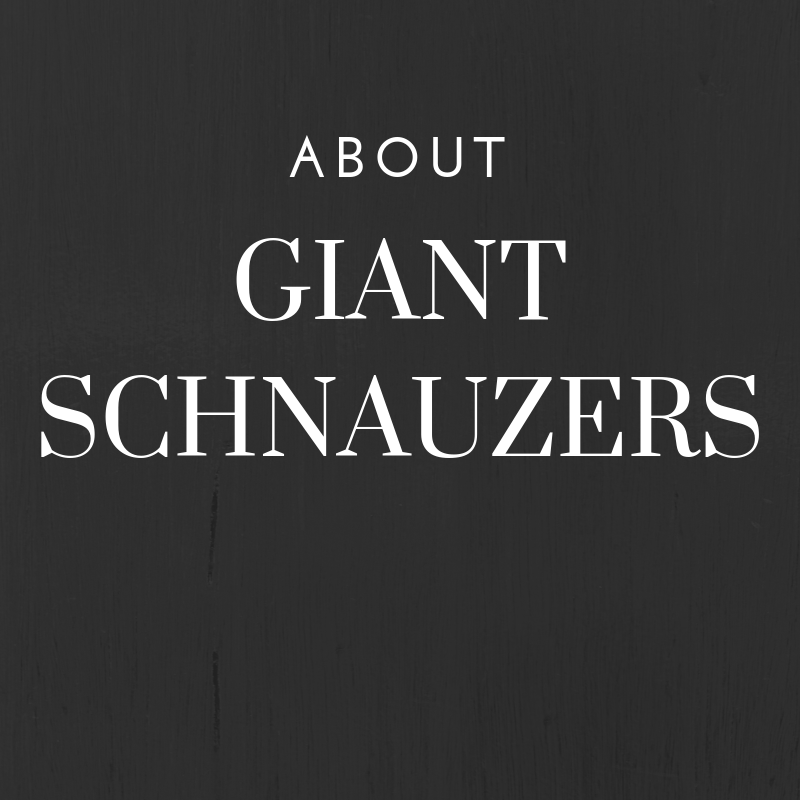 If you are planning on a Giant Schnauzer or already have one, please check out the new Shop page for products & supplies that are Giant specific. Happy 1st Birthday Duke, Justice and Roman! June 9, 2018 Comments Off on Happy 1st Birthday Duke, Justice and Roman! Giant Schnauzer News,Schnauzer Stuff! He started out loving sticks but he sure loves his ball. This boy has my whole heart & is such a joy, smart, sweet and typical Giant- strong willed and stubborn… and an absolute mama’s boy!